The bona fide, flesh-and-blood definition of a connoisseur is Caleb Braaten, founder of Brooklyn’s finest music label Sacred Bones Records. Not since 4AD Records has a record label dangled from the jagged edge of music’s void to shape tastes 20 years from now. Since 2007, Sacred Bones Records brought the masses Zola Jesus, Pop. 1280, Timmy’s Organism, Pharmakon, The Men, Marissa Nadler and the femme du jour, Jenny Hval. Tilting toward outsider art and its insouciant influence on the world’s cultural fabric, Brooklyn’s finest moved to release music from two giants in filmmaking also known for their fierce love of composition: David Lynch and John Carpenter. Sartre did say the past is dead, and the future does not exist. Sacred Bones begs to differ. The Killed by Deathrock Vol. 2 10-song compilation teases the future with an imperfect collision of post-punk, industrial and goth, doing their best Lazarus trick as un-silenced voices from the past welcomed today. Flowers for Agatha’s “Freedom Curse,” originally released in 1985, is pleasantly remastered here. The Leeds, England, band wore their earnest love for Joy Division on every single brokenhearted track they ever penned. “Freedom Curse” boasts the same tinted lenses and darkened riffs in the color of Daniel Ash’s guitar tone. Hearing this for the first time in the 21st century prompts the question of why Flowers for Agatha never saw the same success bands like The Cure and Sisters of Mercy enjoyed. Despite their brief success, lead singer John Darwin turned his lyrics into poetry, thus becoming well known for his verse and less known for his contribution to the post-punk canon. 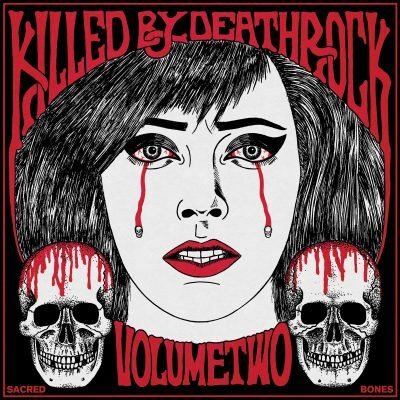 West Yorkshire’s Skeletal Family is one of the few featured on Killed by Death Rock Vol. 2 who continues to perform gloom n’ doom in real time. Reuniting in 2002, Skeletal Family reminded listeners that, like Flowers for Agatha, they, too, could have shared the spotlight with many of their contemporaries, namely their once tour mates, Sisters of Mercy. “Promised Land” is every bit as intense as anything S.O.M. produced; additionally, Editors’ guitarist Tom Smith needs to send Skeletal Family a thank you note for influencing their downstroke, rapid fire attack.